Happy New Year to ATiM (Again)! Happy New Year to all of you! It has been a long, interesting road. . .
Markets are lower this morning on no real news. Bonds and MBS are down small. Not a lot going on today with New Year’s just around the corner. The MBA will be releasing mortgage application data next week, but is skipping this week. Pending Home Sales fell 0.9% in November and are up 5.1% YOY. The Midwest and South had modest gains while the Northeast and West fell. Tight inventory and rising prices are hitting affordability. A good recap of 2015. They discuss wages, consumer confidence and real estate, with a good chart of where the action was (and wasn’t) in 2015. Meanwhile, the IMF is predicting global growth will be disappointing in 2016. They are blaming a slowdown in China and rising rates in the US as the catalysts. Interesting theory about US rates being a drag since G7 yields have been going nowhere as US rates have risen and the spread of Treasuries to Bunds (a proxy for global interest rates) hit a record earlier this year. 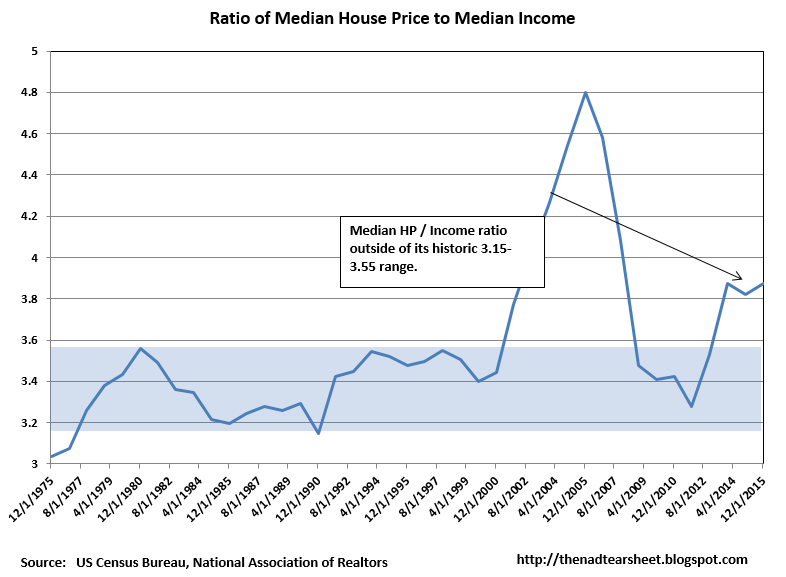 Median incomes are almost back to pre-recession levels, according to Sentier Research. The median income at the end of November was $56,888 and the median existing house price was $220,000. This puts the median income / median house price ratio to 3.87x, which is still a little elevated compared to pre-bubble years. Markets are higher this morning as commodities gain. Bonds and MBS are down. Home Prices rose 0.84% in October and are up 5.5% YOY, according to the Case-Shiller Home Price Index. Portland, San Francisco, and Denver led the charge. For those worrying about how the increase in the Fed Funds rate will affect mortgage rates, don’t worry about a 1-for-1 increase in mortgage rates as the Fed hikes rates. 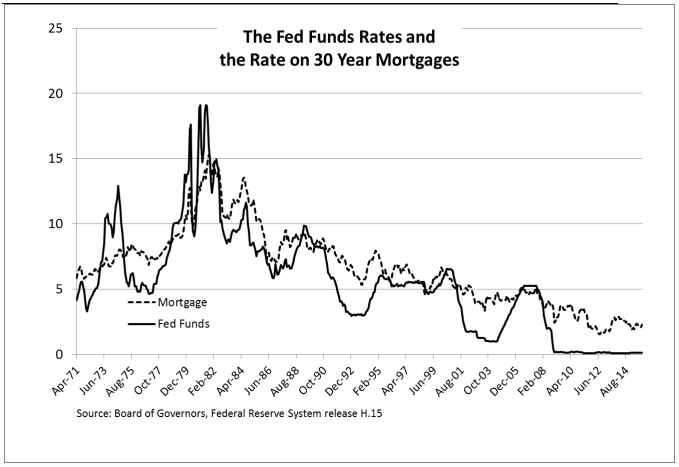 Note that in the 2004-2005 tightening cycle, the Fed Funds rate went from 1% to 5.25% while the average 30 year fixed rate mortgage went from 6% to 6.75%. One thing to keep in mind, however: ARMS that are pegged to shorter-term rates like LIBOR, Fed Funds or Prime will increase as the Fed hikes short term rates. Might be a good time to pitch a switch from an ARM to a 30 year fixed. Ever since the bubble burst, homebuilders have largely focused on the luxury end of the market and the move-up buyer. Fun fact: the average size of a new home has increased by 150 square feet since 2008. Entry-level homebuyers had been priced out of the market. Now that is beginning to change, as builders are focusing on starter homes. High land prices remain an issue. Consumer Confidence rose from 92.6 to 96.5 in December. Retailers had a decent holiday shopping season, with sales between Black Friday and Christmas up almost 8%. Average days to close a loan increased by 3 in November, according to Ellie Mae. Blame TRID. Average FICO slipped a point to 721. Stocks are lower on weaker data out of China. Bonds and MBS are flat. Not a lot of data this week, which will be shortened by the New Year’s holiday on Friday. Not sure if we get an early close on Thursday. Know what did work in 2015? Real estate. Speaking of which, here are the hottest real estate markets according to NAR. As expected, the Bay Area tops the list, and California urban areas are well represented. Know what didn’t work in real estate? The stocks of companies in real estate with names like Stonegate and Nationstar in the dumps. 94% of young renters eventually want to buy a home, according to the NAR. If wage inflation returns, 2016 could be the year that this pent-up demand for housing begins to be felt in the industry. Foreclosure starts are the lowest since 2006, according to Black Knight Financial Services. Fewer than 700,000 active foreclosures remain. Stocks are up this morning on no real news. We are entering the end of year “window dressing” time where a lack of volume allows people to move stocks (at least temporarily). Bonds and MBS are down. Big economic data dump today and tomorrow with the holiday shortened week. Mortgage Applications rose 7.3% last week as purchases rose 4.1% and refis rose 10.8%. New Home Sales rose to 490k from a downward revised 470k in November. Consumer sentiment rose to 92.6 from 91.8. Personal Income and Personal Spending rose 0.3% last month. PCE Inflation was flat on a month-over-month basis and up 0.4% YOY. The core PCE, which strips out volatile commodity related items rose 1.3% YOY. Inflation remains nowhere to be found. Durable goods orders were flat in November, and fell 0.1% ex-transportation. Capital Goods shipments (a proxy for business capital expenditures) fell 0.5%. The Street was looking for 0.5%, so that is a big miss. 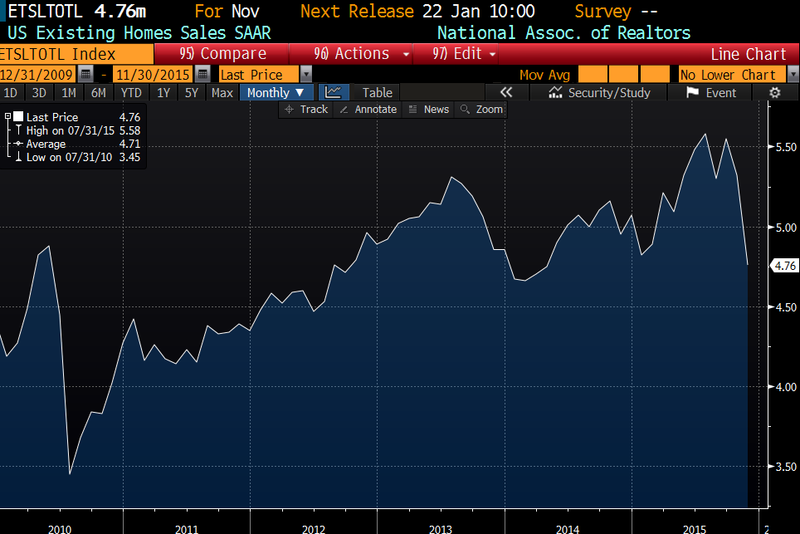 Existing Home Sales fell by a lot yesterday, which was largely attributed to TRID issues. Look at the chart – biggest drop in a long time – certainly since 2010 when the homebuyer tax credit expired. I just finished reading The Righteous Mind: Why Good People are Divided by Politics and Religion, by Jonathon Haidt, a social psychologist formerly at UVA and now at NYU. I highly recommend it. It touches on a boatload of topics that we have talked about here, including that perennial issue of the source and nature of morality. It is written by a self-proclaimed very liberal academic, but he does a pretty good job of setting that aside and except in a couple of places it happily does not approach things within the confines of liberal premises. In fact much of it is aimed at explaining why premises differ so much from person to person. I’ve discovered (after already purchasing and reading it) that it is actually out there on the internet for free, here. To entice you to read it, I’ll leave you with one of the concluding passages, which hopefully shows that my recommendation doesn’t derive simply out of confirmation bias. If you take home one souvenir from this part of the tour, may I suggest that it be a suspicion of moral monists. Beware of anyone who insists that there is one true morality for all people, times, and places—particularly if that morality is founded upon a single moral foundation. Human societies are complex; their needs and challenges are variable. Our minds contain a toolbox of psychological systems, including the six moral foundations, which can be used to meet those challenges and construct effective moral communities. You don’t need to use all six, and there may be certain organizations or subcultures that can thrive with just one. But anyone who tells you that all societies, in all eras, should be using one particular moral matrix, resting on one particular configuration of moral foundations, is a fundamentalist of one sort or another. I am not a relativist; I do not say “I like my coffee with milk and you like it without; I am in favor of kindness and you prefer concentration camps”—each of us with his own values, which cannot be overcome or integrated. This I believe to be false. Stocks are higher this morning on hopes of more stimulus for the Chinese economy. Bonds and MBS are down small. Existing Home Sales fell to an annualized rate of 4.76 million from 5.32 million last month. This was the lowest level in 19 months. Guess what the reason was. The median home price rose to $220,300. which is up 6.3%. Housing inventory is 2.03 million homes, which represents a 5.1 month inventory at the current sales pace. The third revision to Q3 GDP came in at 2%, a slight downward revision from the 2.1% second estimate. A lower inventory estimate drove the revision. Personal consumption was 3%, while the core PCE index (the Fed’s preferred measure of inflation) rose at an annualized rate of 1.3%. Consumption has been depressed for so long that eventually consumers are forced to replace worn out clothes and cars. The average age of a car in the US recently hit a record at 11.5 years, and this is behind the stronger auto sales (along with cheap and easy financing). Housing contributed 15.3% of GDP in the third quarter, about where it was in the fourth quarter. 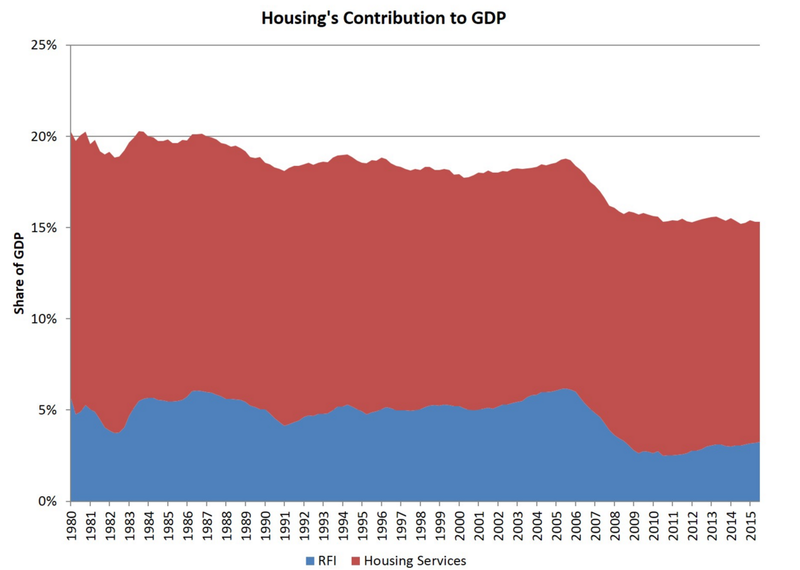 This is well below the historical levels and is explained by the drop in homebuilding. Given that the excesses of the bubble were worked off years ago, inventories are tight, and the Millennial generation is even bigger than the Boomers we will see a pick-up at some point, which should last years. Remember, housing starts averaged 1.5 million a year from the 1960s to 2002 (pre-bubble years). Since 2002, we have averaged under 1.2 million. When you take into account population growth, the deficit grows even larger. House prices rose 0.5% in October, according to the FHFA. On a year over year basis, they rose 6.1%. Looking at the chart, it seems like we are back at the heights of the index set in 2007 or so.The Mountain states led the charge, while the Northeast fell a little. 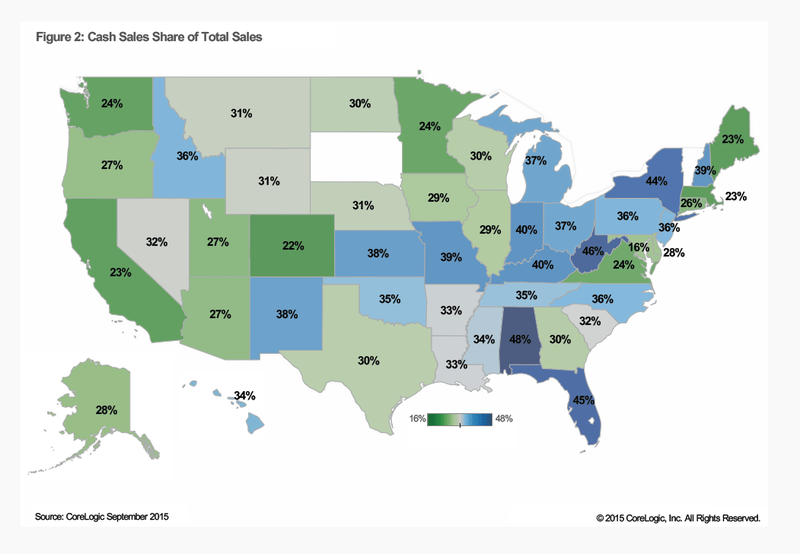 Cash sales as a percentage of home sales fell to 32.5% of all sales from 35.9% a year ago, according to CoreLogic. REO sales tend to be most likely to be cash sales. You can see on the map below the range of percentages based on the state. It looks to correlate most closely with the foreclosure pipelines. More TRID horror stories. Borrowers are having to pay for longer lock periods, and lenders are scrambling to meet closing deadlines. Hopefully this will be a memory in a few months. Non-agency remains an even bigger problem as investors are taking a zero defects stance on TRID and not buying loans.